Reception of this particular VOA Radiogram broadcast has always been hit or miss in my location. Last week, the 17860 kHz broadcast came in quite well. This week was just the opposite: there was hardly any signal at all. 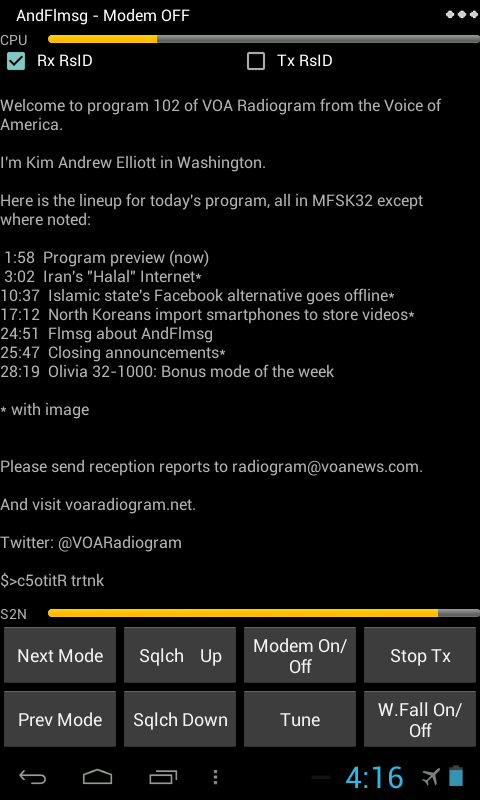 Kim Andrew Elliot starts every VOA Radiogram program with a brief voice introduction. This week, my reception of 17860 kHz was so poor that I couldn’t understand a single word he said. A signal this weak would render any normal voice program completely unlistenable, yet I was still able to decode the VOA Radiogram text and images. The images, though recognizable, suffered quite a bit, but there were no more than a dozen errors scattered in the text of the articles. I was very impressed by the robustness of the MFSK32 data format used by these VOA Radiogram broadcasts. These turned out to be my best image decodes of the week. Reception was quite strong and the text decoded with no errors. Usually, the 15670 kHz broadcast is the one that decodes best in my location. The signal strength was a bit weaker than usual this weekend, but that wasn’t the main problem. The big problem was heavy interference from garbled audio that was stronger than the VOA Radiogram signal itself. I couldn’t determine the source of the interference, but it appeared at several points on the shortwave band and was present on multiple radios. The little I could decipher of the audio appeared to be one side of a conversation, so I’m guessing it was a local amateur radio or CB operator with some transmission problems. 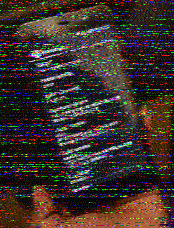 The interference did give me a chance to see how the MFSK32 format deals with heavy interference. The answer was quite well: the text decoded with no errors but the images were pretty damaged. Considering that this audio interference would have made any audio broadcast difficult to understand, a text decoding rate of 100% is pretty impressive. This week’s experiment involved the “Flmsg about AndFlmsg” article, which transmitted as a “plaintext form” designed for decoding by Flmsg (a companion program to Fldigi). It rendered as a web page with no errors. Success! I decoded my first VOA Radiogram this week. I don’t claim to completely understand how I did it but I used FLDIGI. I can see the text and It looked like it decoded the pictures but I can’t find them. Still great fun. Of course, you will need to replace USERNAME with your actual username.